Founded in Omaha, NE back in 1988, jam rockers 311 launched the first “three-eleven day” with the decision to play a marathon 47 songs on March 11, 2000. 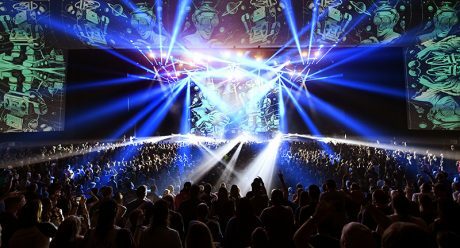 Since then, 311 Day has become an every-other-year tradition, typically filling 14,000+ capacity venues like the Smoothie King Arena in New Orleans or the MGM Grand Garden Arena in Las Vegas. For 2018 — the tenth 311 Day extravaganza — the band opted for two shows at the 5,200-seat Park Theater at Park MGM (formerly Monte Carlo) on the Las Vegas Strip, staging them on Saturday and Sunday, March 10 and 11, instead of just one night. Along with a more intimate, fan-friendly setting — the back row is just 145 feet from the stage — the two-night format enabled the band to perform 86 songs total. 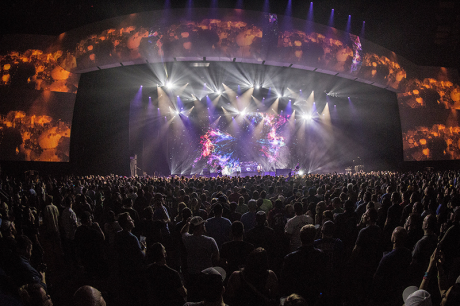 Along with the creative use of automation to transform the moving light rig incorporated within 10 lighting pods, the lighting design for 2018 was also enhanced with a big new emphasis on video — not only from the imagery appearing on an 80-foot-wide wall upstage, but by the use of 8K resolution projection mapping on the huge proscenium projection surfaces framing the show, which measured 260 feet across the top of the stage and rising 50 feet on each side. Seven HD projectors and two 4K projectors cover the entire surface. 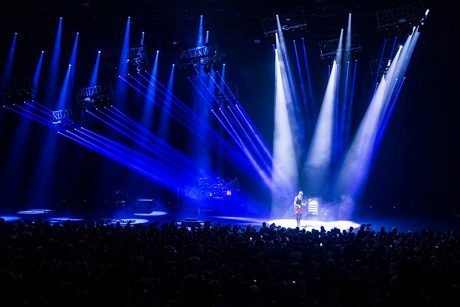 Joe Paradis, the band’s longtime lighting designer, who was busy with another full-time project, gave his blessing for his programmer and assistant Bobby Grey to take over design duties for the 2018 event. Grey, an associate of Sightline Design Group, credits Paradis as one of his main mentors. “It was an honor to do this,” Grey says, while also acknowledging the challenge of coming up with all the visual accompaniment to the marathon sets of music. “Walking into this very video heavy environment was new territory as far as the band’s production.” Tasked with overseeing all video aspects along with the need to augment the Park Theater’s house lighting rig with gear from AG Light and Sound, Grey called upon his friend and frequent collaborator Jack Banks to help him wrangle the projection mapping. The staff at the venue told Banks and Grey their utilization of the system was unlike any they had never seen before. 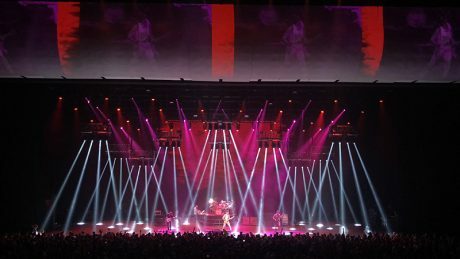 The marathon of “Wow” moments began with the show’s opening visuals, which included the creative use of lighting pods on moving automation truss to open the show. This allowed the beams to simulate the look of a UFO to bring the band members onto stage. The immersive projection mapping covering the entire room, meanwhile, suggested the celestial cosmos from which the UFO arrived. Keeping the rig versatile and dynamic played well with the 80-by-40-foot 4K LED screen playing against the back wall of the stage. disguise and Notch integrate to create an immersive experience. The automated pods played a huge part towards that goal. “It was more than just a lighting rig. This was architecture we were creating,” says Grey. Moving the truss in black between songs reveals a lighting rig looking completely different. Moving the truss with the stage lit and pods active creates dynamics. When the lead singer appears onstage with just his guitar, Grey brought the pods to an intimate low trim. During a bass solo, the whole rig slanted, rather than just a few fixtures. The idea for a 3D animation of the iconic 311 logo in marquee lights came to Grey flying to the gig, which he then created in Cinema 4D.Though the logo emanates from the 4K upstage wall, it looks as if it were floating center stage. Aron Altmark of Visual Endeavors created a sequence of logo loops as well. “The lighting was all about the hybrid fixtures,” says Grey. “I really like this new class of hybrid fixtures out, the Claypaky Mythos. “The [Martin] MAC Axiom and Robe MegaPointe are real workhorses. The Mythos, to me, is a Claypaky Sharpy with color changing capability. It’s really wonderful, but it is so much more. Grey, who “practically grew up with this band,” is passionate about everything he does, but adds that he was “really excited” about this particular labor of love. Claypaky Mythos are the workhorses of the design. Automated truss adds dynamics to lighting P-Nut.